This paper introduces a framework for quantum exact learning via queries, the so-called quantum protocol. It is shown that usual protocols in the classical learning setting have quantum counterparts. A combinatorial notion, the general halving dimension, is also introduced. Given a quantum protocol and a target concept class, the general halving dimension provides a lower bound on the number of queries that a quantum algorithm needs to learn. For usual protocols, this lower bound is also valid even if only involution oracle teachers are considered. The general halving dimension also approximates the query complexity of ordinary randomized learners. From these bounds we conclude that any quantum polynomially query learnable concept class must be also polynomially learnable in the classical setting. Castro, J. 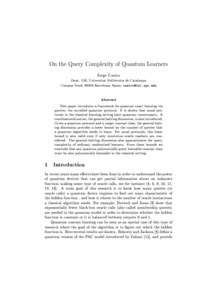 "On the query complexity of quantum learners". 2005.